The US Congress on Friday sent a bill to President Donald Trump's desk to ensure federal workers furloughed during the ongoing partial government shutdown are paid retroactively. 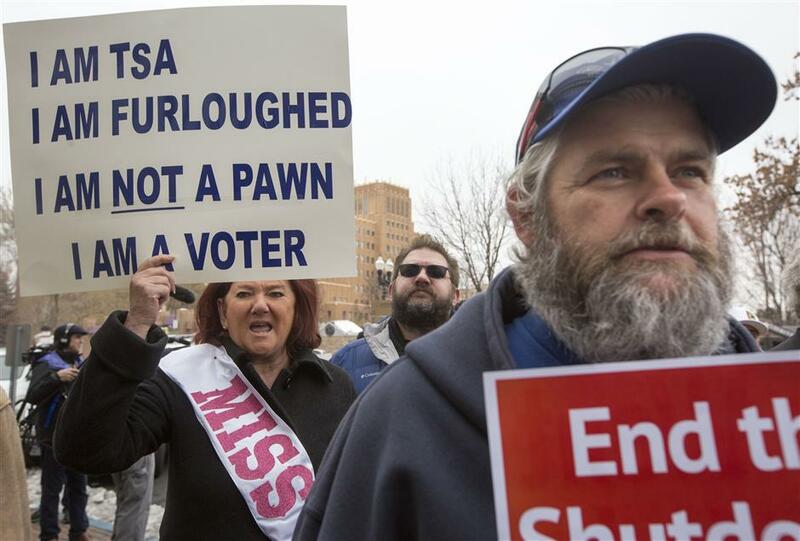 TSA employee Marae Persson (L) holds a sign protesting the government shutdown at the James V. Hansen Federal Building on January 10, 2019, in Ogden, Utah. The House of Representatives voted earlier on Friday to approve the retroactive pay bill, which was unanimously passed by the Senate a day earlier. Trump is expected to sign the bill, offering support to about 800,000 federal workers who have been forced to go on unpaid leave or work without pay since December 22 when the shutdown started. Hundreds of thousands of federal workers already felt the bite of missing a paycheck which would normally arrive on this Friday. As many as 78 percent of American workers reported they were living paycheck to paycheck, according to a 2017 report by employment website CareerBuilder. The president has locked himself in a stalemate with congressional Democrats in the dispute over his demand for US$5.7 billion for funding a wall along the US-Mexico border. The partisan fight, with no end in sight, is about to make the partial government shutdown the longest in US history on Saturday.